Nice-looking medium size resin garden storage unit for all your storage needs. Perfect for storing your lawn mower and all your garden tools, your ladder, the kids’ bikes and toys, pool equipment and even your outdoor furniture and BBQ gear. This shed not only comes with the flooring kit included but also has a fixed window and a skylight sheet to let natural light into your shed. Shelving is also included with this shed for your convenience and to save you even more. Available in the elegant Taupe/Beige colour combination with wood-look texture on the wall panels and it comes with lockable extra wide (1385mm wide) double door for easy entry. Made from high quality UV stabilised polypropylene resin and has a steel-reinforced structure. The unit is waterproof, maintenance free and easy to clean, it will never rust, rot dent or peel. 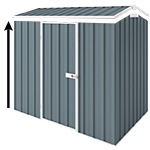 This well ventilated unit has a 11.6m3 storing capacity and to keep your shed in order, the 8’ accessory kit can be added to your shed below. Step by step assembly instruction is included in the package to make sure the installation is a fun and stress-free project.